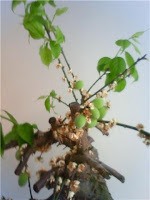 HOSTEL 64 Osaka : staff blog: found a Japanese plum ! found a Japanese plum ! I found that a plum tree in hostel64 had small plums today. It was rainy for a while in Osaka,so plums grew at a dramatic rate. The Japanese plum trees are common sight in the season before spring. The plums are used to make pickled plums[Umeboshi],plum wine[Umeshu]and sweets. Our hostel has the plum wine. So let's try it when you are coming.